Rightside’s debut as its own publicly-traded company is imminent. Demand Media plans to complete the spin-off of its domain name business on August 1. Rightside will become its own public company on that date. It will trade on the NASDAQ under the symbol “name”. Demand Media shareholders will receive one Rightside share for each five shares of Demand Media stock they own. Registry Service – Rightside Registry provides domain name registry services to new TLD operators including Donuts and itself. Registry – the company is an applicant for many of its own new TLDs. It will probably operate around 50 of its own top level domain names, including .ninja and .democrat. Domain Registration – Rightside owns both the largest reseller registrar (eNom) and a large retail registrar (Name.com). Domain Parking – the company owns domain parking company Hotkeys. It also parks a number of domains on its registrar platforms. Expired domains and aftermarket sales – NameJet is a 50/50 partnership between Rightside and Web.com. Domainer – Rightside is also a domainer investor with over 300,000 owned and operated domain names. Rightside’s growth is highly dependent on the success of new top level domain names. Demand Media is spinning off its domain name business as a new publicly traded company, Rightside. Today the company filed documents with the U.S. Securities and Exchange Commission that give the public much more detail on the business. Having reviewed the documents for much of this morning, one thing became very clear: a bet on Rightside is a bet on new top level domain names. The business is somewhat stagnant and is counting on revenue from new TLDs for growth. Let’s take a look at the top line numbers. In 2012, Rightside would have grossed $173 million as a standalone company. Its adjusted EBITDA was $22.8 million with a net loss of $1.0 million. Its topline number was up about 8% from 2011. For the 9 months ending September 2013, the company had revenue of $139.6 million, adjusted EBITDA of $8.9 million, and a net loss of $5.0 million. The company reports two segments in its financials: Domain Services and Aftermarket & Other. Domain Services includes its domain registration business, and will include the registry/newTLD business going forward. Aftermarket & other includes revenue from NameJet (a partnership with Web.com), parked revenue on its own portfolio of domains as well as partner domains through its domain parking service, and revenue from selling domains from its portfolio and from selling domains not renewed by its own customers. Domain Services generally accounts for 70%-75% of revenue, with the balance coming from Aftermarket & Other. Although the company is reporting slight topline growth each year, it’s not really indicative of a growing business. For example, so far this year its Domain Services revenue growth can be attributed to registry price increases that were passed along to customers as well as the incremental revenue from Name.com, which it acquired at the end of 2012. It also counts on a single reseller – NameCheap.com – for 23% of its total domains under management. Its contract with NameCheap comes up for renewal at the end of this year. NameCheap has all of the negotiating power as it can threaten to flip the switch and run its own registrar operations or switch to another reseller platform. On the Aftermarket & Other revenue side, it grew in the most recent period thanks to selling about about $4.7 million more of domains from its own portfolio than in the prior year. The domain parking business continues to decline. This is why Rightside is so focused on new top level domains: it’s looking to them for growth. Let’s face it, Rightside isn’t the only domain company not growing like it used to. That’s why Rightside and many other companies are betting big on new TLDs. A significant portion of our future revenue is expected to be derived from our registry services business. If we are unsuccessful in marketing and selling our gTLDs or there is insufficient consumer demand for our gTLDs, our future business and results of operations would be materially adversely affected. As the number of domain name registrations increases and the number of available domain names with commercial value in existing TLDs diminishes over time and if it is perceived that the more desirable domain names are generally unavailable (and new gTLDs are not seen as a viable alternative), fewer Internet users might register domain names with us. If this occurs, it could have an adverse effect on our domain name registration revenue and our overall business. Note the parenthetical part – Rightside needs the public to view new TLDs as an acceptable alternative to existing domains in order to grow its business. Hence the spinoff’s name selection of Rightside. If the right of the dot doesn’t take off, then Rightside’s business doesn’t take off, either. * Rightside has acquired registry contracts for .futbol and .reviews from Donuts. * Discloses some revenue from Name.com specifically. Name.com had $13.2M revenue for the 9 months ended Sept 30, 2012, with $1.4 million net income. 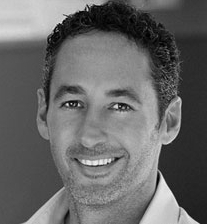 Demand Media acquired it for $18.0 million. * NameJet has sold more than 400,000 domains over the past five years. * If you enjoy gawking at salaries, you’ll find the compensation details for Rightside’s top paid employees and directors in the filing. * Rightside has 240 employees and plans to increase headcount 10%. Rightside has two more top level domain names in its new TLD portfolio. Demand Media filed documents with the SEC today related to its spinoff of Rightside, and also published an investor presentation. The disclosures show that Donuts has assigned rights for two new top level domain names, .fubol and .reviews, to Rightside’s United TLD. These domains were applied for under Donuts’ subsidiaries Atomic Falls, LLC and Extra Cover, LLC, respectively. The two domains were part of 107 applied for underneath subsidiary Covered TLD, LLC. It’s widely believed that the 107 under Covered TLD are ones that United TLD has rights to gain an ownership stake in. 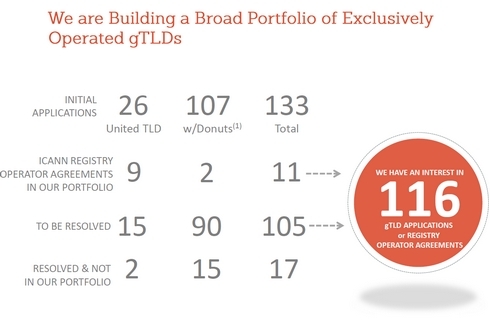 Rightside’s investor presentation shows that, of the 107 TLDs originally in the deal with Donuts, it has acquired 2 and 90 remain. As for the 15 “resolved and not in our portfolio”, that likely includes domain names in which contention sets were settled through private auction that Donuts/Demand Media received funds from, domains that lost objections, and potentially ones it decided to let Donuts run exclusively. I suspect .futbol and .reviews are the first of many that will later be transferred to United TLD. According to Demand Media’s investor presentation, it has “equal rights” in the remaining 90 TLDs under the partnership. New top level domain name contracts may be assigned, but parties are required to give ICANN 30 days notice. The new party must meet ICANNs “policy on registry operator criteria” and takes over all obligations of the agreement. As of this morning, ICANN’s registry contracts page does not show the assignment of these two TLDs. A Donuts spokesperson declined to disclose to Domain Name Wire how much United TLD paid for the domain contracts. I have not yet located any relevant figure in Rightside’s SEC filing, but I’m still searching. Donuts confirmed to Domain Name Wire that domains that are assigned to United TLD will not be eligible for Donuts’ Domains Protected Marks List program. However, the Rightside SEC filing shows that this service is one of its own registry offerings, so its possible they can be blocked through a different offering. RNC loses objection against Demand Media’s application to run .republican top level domain name. The Republican National Committee (RNC) has lost a community objection it filed against Demand Media’s application to run the .republican top level domain name. The RNC, which uses the domain name gop.com, is behind an application for the .gop domain name. This case is really interesting, as panelist Brigitte Stern provided a very detailed analysis of the language of community objections and what the point of these objections is. The analysis hits on an issue that has stood out in community objections: can a group that represents just a part of the overall community to which a domain will be targeted be able kill an application on community grounds? In this particular case, the RNC argued it represents the “Republican Community.” But much of the proof it submitted was based on representing the U.S. Republican Party. Stern determined that it had standing to object for the community of the U.S. Republican Party, but not the undelineated overall worldwide republican community. The Republican Community is reported by the Objector to have been in existence for 150 years. The Expert is forced to characterize this as an affront to history. Republican communities have existed since ancient times and many countries have been guided by the idea of republicanism throughout their political history. The Objector appears to wrongfully assimilate the history of its institution with that of the idea of republicanism. [The panelist] can either consider that “substantial opposition” simply refers to the community which the Objector considers itself as representing (Option A) or that it refers both to this community and to the community to which the new gTLD string is explicitly or implicitly targeted (Option B). The Expert will therefore first examine the consequences of Option A. If the substantial opposition referred only to the community in the name of which the opposition is filed, this would render this requirement almost meaningless. Indeed, it would allow almost any small and even a very small community in the world to submit a successful objection if all its members were in agreement. …To accept that a small and even very small unanimous community represented by a duly established institution could successfully object to a string virtually applicable to millions of people in the world would defeat the process of validation of the new gTLD strings set up by ICANN. Stern obviously believes in option B. This is something that has bothered me in community objections. Consider .hotel. The objectors lost, but on the basis that they failed to prove likelihood of material detriment. Yet the objectors only purported to represent hotel owners, not hotel users. Aren’t hotel users part of the community that is targeted by the domain? There are many more hotel customers than hotel owners, so it’s not clear to me how the objectors were able to call the community just themselves. That said, with some panelists the objectors are better off arguing they represent only a portion of the community targeted by a domain, but show significant opposition within this portion of the community. Consider the community objections filed against .cloud. The Cloud Industry Forum tried to argue there was a clearly delineated community around the “cloud,” but the panelist pointed out that basically everyone in the world would fit into its definition. Had the Cloud Industry Forum said that the community it represented was just made up of on particular part of the community – say, data center operators – it may have qualified as clearly delineated. I think just about everyone and anyone falls into the community of strings like hotel, too. I can’t see how there are clearly delineated communities around things that everyone is a part of – health, sport, etc.